Click on the title to view photo in large format. The Main Square in Krakow, Poland, is one of the largest medieval town squares in Europe. Three large buildings dominate its central open space: St. Mary’s Basilica, with its soaring Gothic towers (shown in the photo); the historic Cloth Hall; and the Town Hall Tower. The entire square is surrounded by historic townhouses. During the spring, summer, and fall, the Main Square hosts all manner of festivals and performances. But nighttime is when this public space really shines – literally. 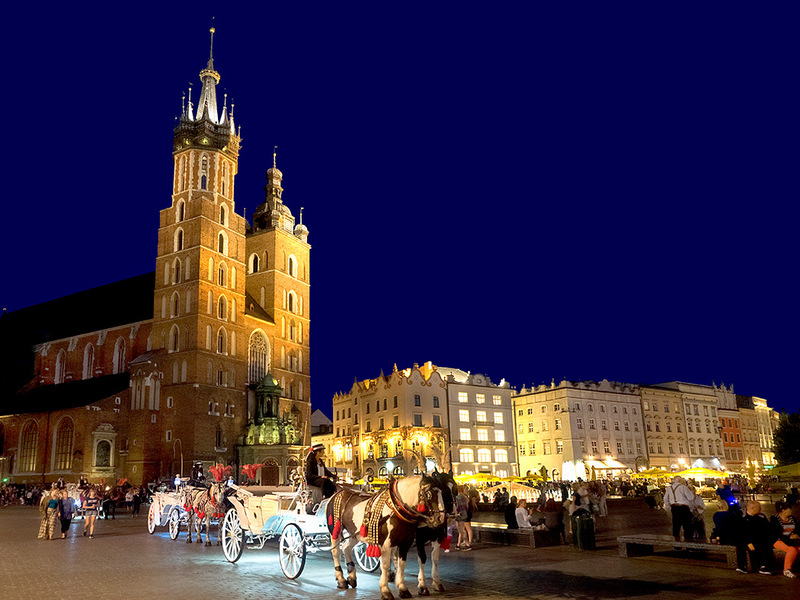 Every building in and around the square is brilliantly illuminated, and horse-drawn carriages wait patiently in front of the Cathedral to carry passengers on tours of Krakow’s beautiful Old Town. ← Day Trip from Vienna to Salzburg – Is It Possible?